Happy Sunday and thanks for joining me the another FB Live! It’s all about kits!! Stampin’ Up! kits are great for new crafters and avid crafters who are looking for quick and easy projects such as cards, goodie bags, planners, and more. The awesome part is that everything in the kit coordinates and all of the contents are pre-measured, & precut. All you have to do is stamp & assemble. So the kit I will feature today is one that was at the top of my purchase list and it’s called Notes of Kindness. This kit contains products that make it easy to thank someone or make someones days. And I must admit, the colors in this kit bring the projects together beautifully! This kit makes a total of 20 cards (5 each of 4 designs). It comes with everything pictured above which is what makes kits a great starting point for beginners. There is even a Notes of Kindness Card Kit Refill available to create 20 additional cards. 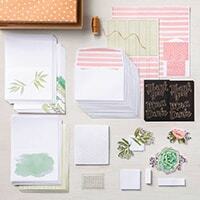 Check out the 4 cards you can create from the Notes of Kindess Card Kit. 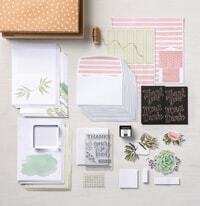 And we can’t forget about the awesome Paper Pumpkin Monthly Subscription Kit!! These products would make great additions to your collection and great gifts!! Give them a try!! There’s a new code for the month of JULY! !